In the interests of comprehensiveness — as well as a little bit of banging on that "I'm right, you know" — I risk being boring by adding one more new development to my list of gadgets that pre-figure a future of martini (ubiquitous, on-demand) media. This follows an original article on this subject, and a first postscript. Griffin Technology's radioSHARK is a $70 (less than £40) device that you plug into your USB port, allowing you to schedule recording of FM and AM radio programmes onto your hard disk, and then move them directly onto your iPod. It does for FM/AM what the Bug does for DAB digital radio, with the added advantage that whatever your record is already on your hard disk. At the time of writing, the radioSHARK is available via the Apple store in the US, but not the UK. I don't know what's behind this, or if and when it's likely to change. It works with Macs and PCs. A short postscript to my recent posting on harbingers of martini media: a US announcement of a handheld satellite radio that can receive 130 digital stations and record up to five hours of music, which you can schedule when you want. Here's the official page and specs for the Delphi XM MyFi™, and here's an interesting, if slightly contrived, comparison of the benefits of the MyFi against iPods-plus-podcasting. One selling point of MyFi for some people will be "No computer downloading or list management; absolutely no computer needed." I've collected some more reviews and stories on the MyFi in my collection of bookmarks on music devices. Outside the tube station I saw people stop and point with open mouths at the Evening Standard news boards that read 'DJ John Peel Dies'. The last time I heard John Peel's voice on the radio — I don't know if it was the last time he was broadcast before he died — was two nights ago on Andy Kershaw's programme. Andy played a tape of a twenty-year-old John Peel programme where John introduced, uncannily, the song They're Cutting my Coffin at the Sawmill. (If you have the stomach, you can hear this until next Sunday.) Someone had written in pestering Andy to play the song, believing that Andy had himself played it in the '80s, though he had no recollection of it. Another listener realised that it was actually John Peel that had played the song (mentioning Andy with customary generosity when introducing it) and that listener had kept his tape of the programme for the last twenty years. There are a million stories like that. Before the age of the Internet you could walk into a West Berlin bookshop where they'd be playing imported tapes of his programmes. Though it's shocking to have an apparently limitless, unending stream of great radio come to a sudden stop, no-one can say that John Peel sold anyone short. We can only be enormously grateful for all the lives that he wove his way into. I'm just back from seeing Instructions for Forgetting, the opening piece of Forced Entertainment's two-week Indoor Fireworks festival, which made me realise I should have plugged the festival before now, and I've been neglecting the Cultural Calendar section of this site. As well as six performances of their new work, Bloody Mess, next week — I'm going on Thursday — there are other performances by the company, some of their video work, shows by other performers that they've selected for the festival, and on the final day (6 November), talks by academics, the eight-hour durational work Marathon Lexicon, plus a big party to celebrate twenty years since the company was founded. Further details of Bloody Mess (including trailer) and archive pages. See also Forced Entertainment's Imaginary Evidence CD-ROM, in the design of which I had a small hand. Continue reading "Podcasting: another harbinger of martini media"
There's a certain inevitability about this. As convergence comes to fruition, the digital world has a hell of a lot of frequencies, bandwidth and disk storage to use up (cf. an iPod is an "empty beer glass waiting to be filled") . On the other hand, there's a massive pile of historically and culturally exciting stuff hanging around doing nothing. It's natural that policy makers and regulators should want to get this material to an audience one way or another. This is an acutely sensitive issue at a sensitive time for the BBC. As anticipated in my previous posting on the BBC's digital direction, they need both to conjure a seductive vision of potential archive offerings, and to position themselves so that they are central to delivery of this vision. In this light, reports that the first pilot of the BBC Creative Archive may be too little too late must seem a bit worrying. Speaking of social software (see previous posting), if you're in striking distance of London and interested in meeting people working in the design, new media, Internet, television, film, computer entertainment, music, press/publishing, radio and advertising sectors, you're invited to a meeting I've organised through the Ecademy online and offline network. Here are the details of the meeting on 28 October. To register for the meeting you have to join Ecademy, which is free and there's a link from the meeting details. Though no-one will turn you away if you come along and haven't registered. Ecademy is the best mix of online and offline activity that I've experienced — if you're in a metropolitan centre like London — and this event is under the umbrella of the 'media playground' club within the larger Ecademy network. Some of the results of the Guardian digital music survey that I reported earlier were published on Friday. Unfortunately these results don't add much to the sophistication of anyone's understanding. Basically they say that people are still wary of downloading, but that more people are paying for downloads than a year ago (which everyone already knew from sales figures). And broadband will make downloading more attractive. The survey is a missed opportunity in concentrating on short-term trends focused exclusively on downloads. 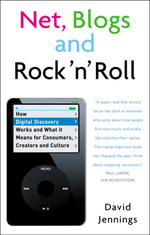 It ignored longer-term shifts in the broad picture of how people learn about music, including streaming, live events and intermediaries other than download and file-sharing sites. My original posting gives a more extended critique of these points.